The images in this gallery are iconic photographs, famous for their capacity to take the viewer into the heart of children’s experiences of war and communicate fundamental truths about the reality of war. 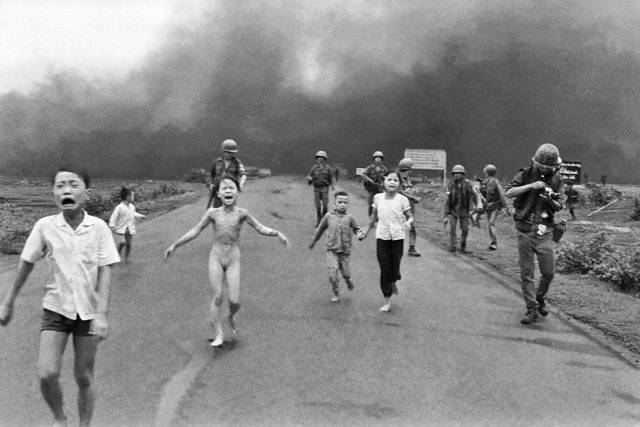 An iconic photograph is widely known because it represents a larger idea, for example the photo of the girl fleeing from napalm has become iconic of the war in Vietnam. Most of these images were taken by famous photographers. Through their skill in lighting and composition these artists are able to create powerful impressions. But sometimes the content of a photograph is just as important. Some photographs that have been identified as iconic were snapped by amateurs witnessing extraordinary events. A number of these photographs have had an impact on history through their huge influence on public opinion. Many, but perhaps not all, of these images will be familiar. Rather than providing information to direct your reaction, we have only provided a short label. This allows you to come to your own conclusions about the message and impact of each photo. To learn more about these photos, notes are provided at the end of this gallery. 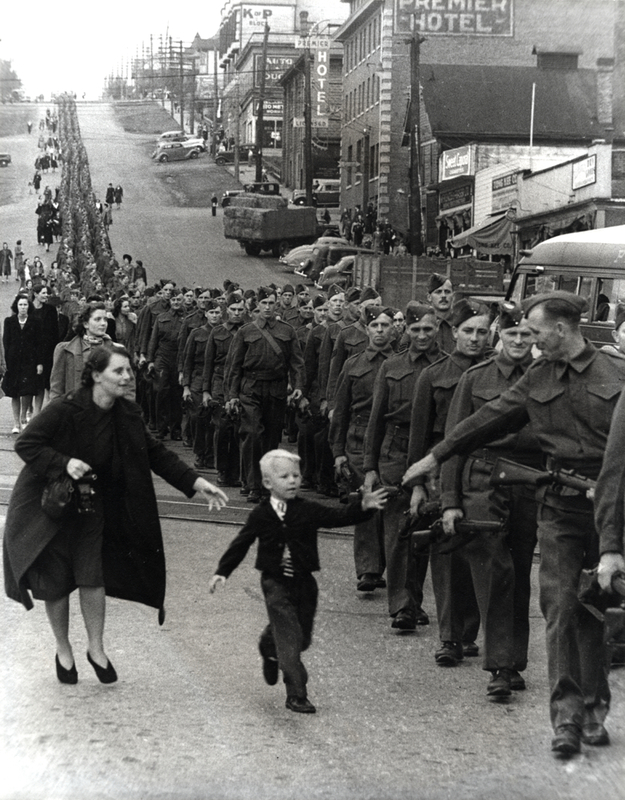 This photo was celebrated as an iconic symbol of Canada at war as it captured feelings shared by so many families. On October 4, 2014 a series of three bronze statues of the image were unveiled in New Westminster. This photo was taken in Barcelona, Spain, on January, 1939. 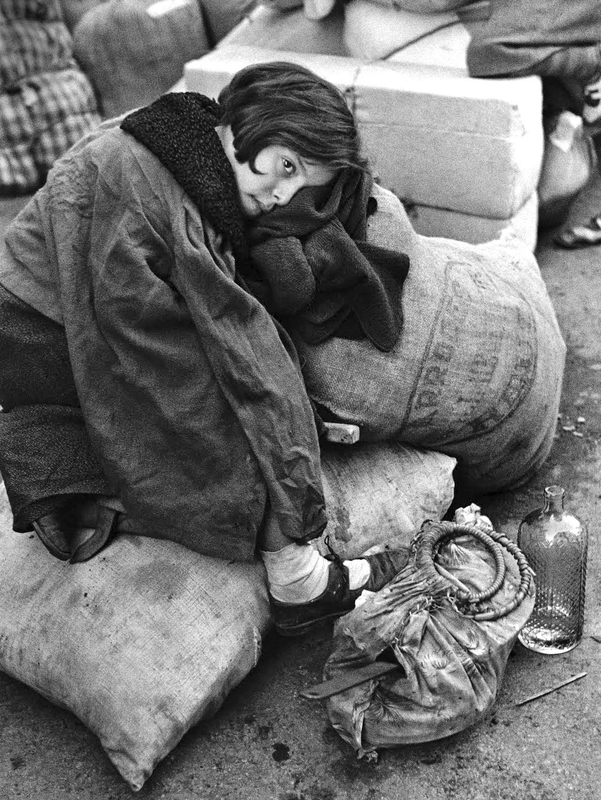 It is one of many images taken by photojournalist Robert Capa of the Spanish Civil War (Dates: July 17, 1936 – April 1, 1939). This photo, taken in April, 1943 was originally captioned “Forcibly pulled out of dug-outs”. The photo was included in Jůrgen Stroop’s report to Henrich Himmler, commander of the Nazi Germany’s “Final Solution” to eliminate the Jewish population. 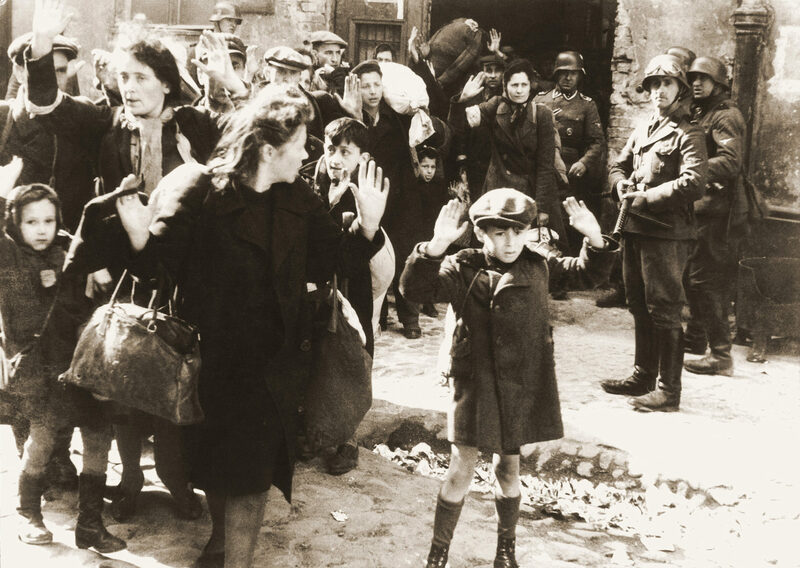 An uprising started in April 1941 when the Jewish population resisted Stroop’s order that all Jewish residents in the Warsaw Ghetto were to be transported to the Treblinka extermination camp. In retaliation Stroop ordered the burning of the Ghetto. Approximately 13,000 Jews died. Cecil Beaton, born in 1904, was a famous fashion photographer. However, he abandoned this work during WW II to document the fighting in England, Africa and the Middle East. 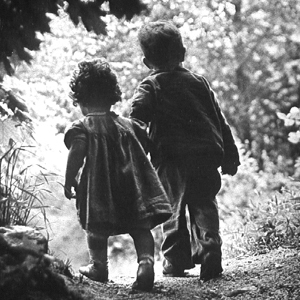 This photograph was one of his most famous. 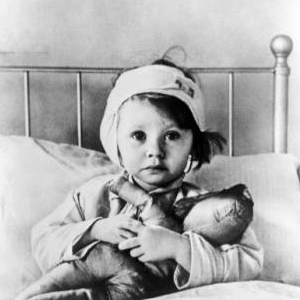 It shows 3-year-old air raid victim Eileen Dunne who was hospitalized following Germany’s bombing of London. 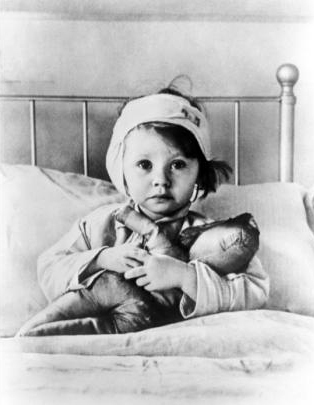 This photo was featured on the cover of Life magazine and was used to illustrate the huge impact of this war on children. After the war ended, Cecil Beaton resumed shooting portraits of the rich and famous. 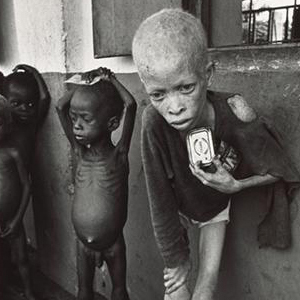 This photo, dated 1969, brought the world’s attention to the huge suffering the Biafra War was causing children. 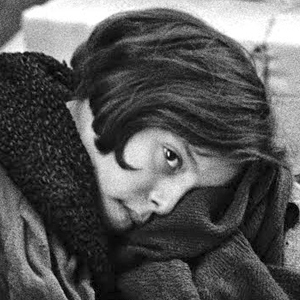 It was taken by Don McCullin, a famous war photographer. (Dates of Biafra War: July 1967 – January 1970). The war was provoked by the desire of the Biafra region in southeast Nigeria to become an independent state. Nigeria refused this secession and implemented a blockade of food and supplies to the Biafra region. Approximately 3 million civilians died from fighting and starvation. The starving albino boy is clutching an empty corned beef tin. 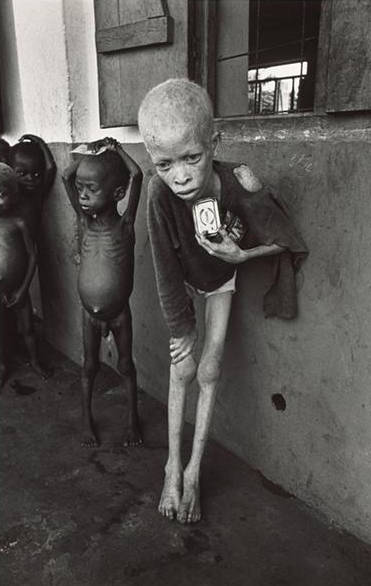 Don McCullin used this photo to bring attention to the Biafra War as well as the situation of albino children who suffered – and continue to suffer – from high levels of prejudice in Africa. 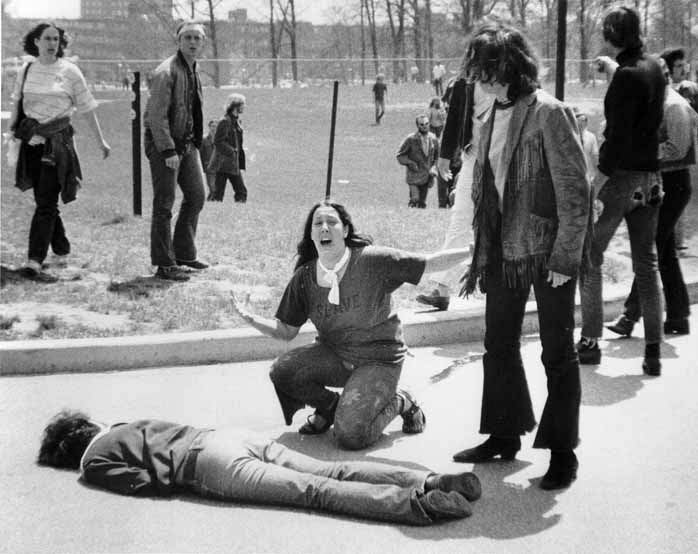 “The war comes home” was a frequent caption for this image of the shootings at the Kent State University protest against the Vietnam War, dated May 4, 1970. 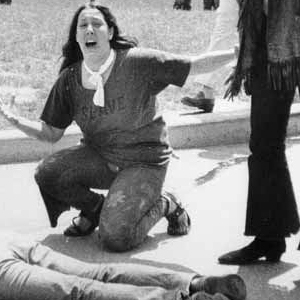 The photo shows 14 year-old runaway, Mary Ann Vecchio, kneeling over the dead body of 20 year-old Jeffrey Miller, one of four victims in the Kent State shootings. The photograph was taken by John Paul Filo, a university student. In 1970 US President Nixon announced that 150,000 more troops would be drafted to fight in the Vietnam War. Students all over the United States gathered to protest this action and the US involvement in the war. At Kent State 900 National Guard troops were dispatched to the campus and 28 National Guardsmen opened fire on the protesters. They killed four people and wounded nine. The Kent State massacre – and this photo – had an enormous impact. It triggered the only national student strike in US history. Public opinion began to shift and opposition to US involvement in the Vietnam War grew. The United States was involved in the Vietnam War from 1954 until 1975. “There was the noise of an airplane coming. The first plane dove and dropped two bombs. The second one, an A-1 Skyraider, poured napalm. We thought, “Wow, the bomb was close,” but we didn’t think there were any people still there. What is napalm? Napalm is a jelly-like substance that, when ignited, sticks to practically anything and burns up to ten minutes. 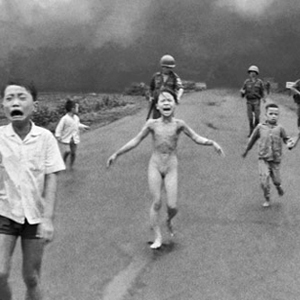 The effects of napalm on the human body are unbearably painful and almost always cause death. 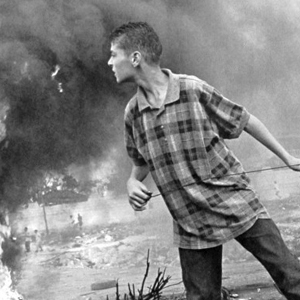 U.S. troops used napalm in the Vietnam War from about 1965 to 1972. 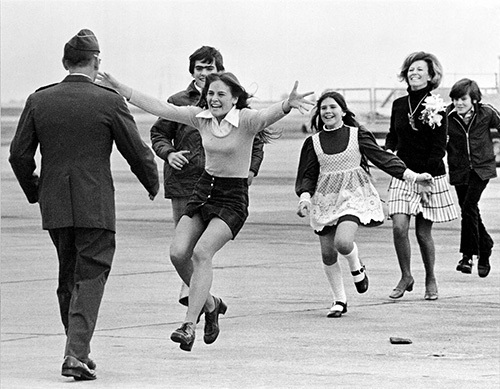 This photo, dated March 17, 1973, shows Lt. Col. Robert L. Stirm, an Air Force Fighter pilot, being reunited with his family after he had been missing in action for over six years. He had been shot down over Hanoi in 1967. Associated Press photographer, Slava “Sal” Veder, saw the family reunion and started taking pictures. “You could feel the energy and the raw emotion in the air,” says Veder. He titled the photo Burst of Joy. Unfortunately, the family reunion had its difficult side. Three days before Stirm arrived at the airport where this photo was taken a chaplain had handed him a letter from his wife in which she asked for a divorce. “I can’t help but feel ambivalent about it,” Stirm says of the photograph. “I was very pleased to see my children. I loved them all and still do, and I know they had a difficult time. But there was a lot to deal with.” His daughter Lorrie says, “So much had happened. There was so much that my dad missed out on and it took a while to let him back into our lives and accept his authority.” Her parents were divorced within a year of his return. Burst of Joy was published in newspapers around the nation and went on to win a Pulitzer Prize in 1974. It is often labelled the best homecoming photograph of the Vietnam War. 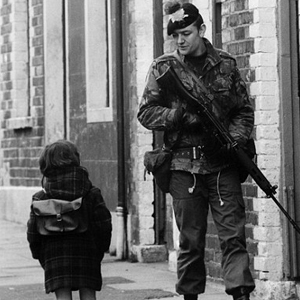 This photograph was taken in Belfast, Northern Ireland in 1981 at the height of “The Troubles”. 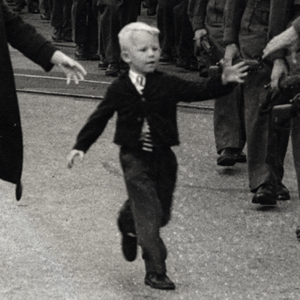 This image (and others like it) was used to illustrate how children were viewed as the enemy by British soldiers. Conflicts between England and Ireland have been ongoing for centuries. They have largely focused on issues of home rule. 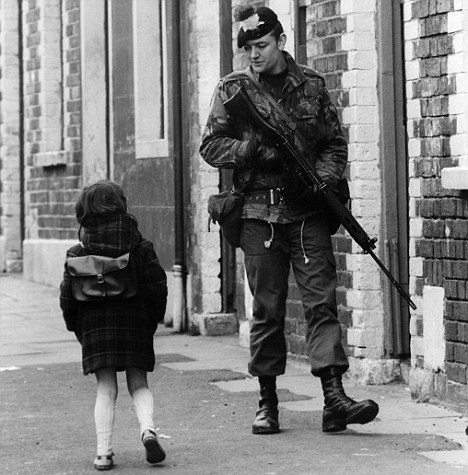 “The Troubles” (1969 – 1997) refers to the most recent period of violence between nationalists (mainly self-identified as Irish and/or Roman Catholic) and unionists (mainly self-identified as British and/or Protestant). Both sides demanded absolute loyalty from their followers. This was a war fought on city streets and playgrounds. 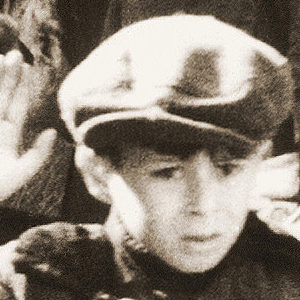 Children were highly implicated as both sides used them as messengers, spies and, in some cases, to help plant bombs. 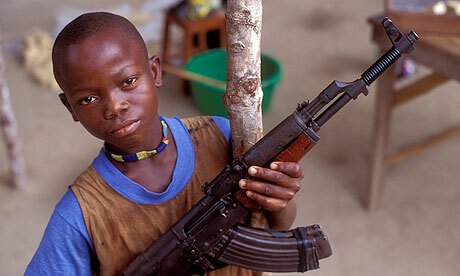 This picture is of a child soldier in Sierra Leone’s war. (Dates of conflict: 1991 – 2002). It was taken by a UNICEF employee as part of the agency’s participation in the campaign against the use of children as active agents in armed conflicts. 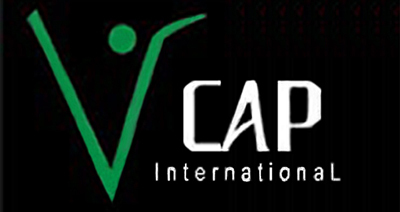 This has involved hundreds of organizations. One of the most effective tools has been photographs like this one. 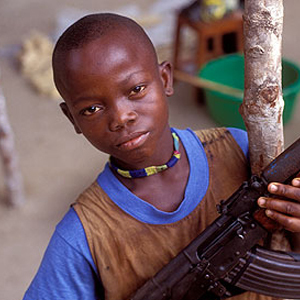 The civil war in Sierra Leone occurred from 1991 until 2002. 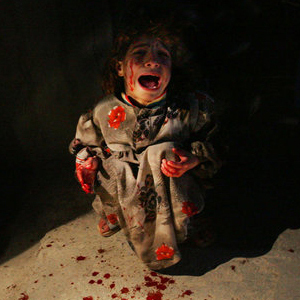 Thousands of children were used by both government and rebel forces. They were used for guarding diamond miners, attacking villages, committing atrocities and sexual exploitation. In 1984 and 1985 Eastern Africa experienced a catastrophic drought. There were wars in several regions, particularly Chad and Ethiopia. These factors increased the exodus of refugees in their struggle for survival. 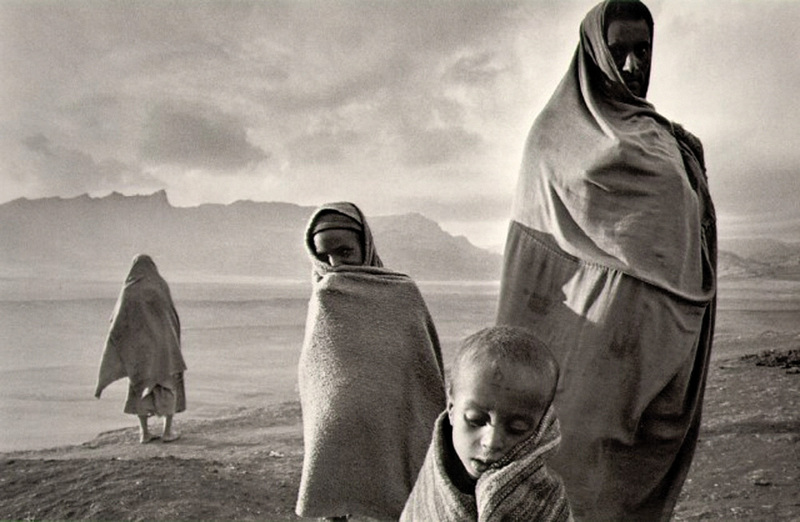 Sebastião Salgado documented the lives of these people from Mali, Chad, Ethiopia, and Sudan. The images were seen throughout the world. 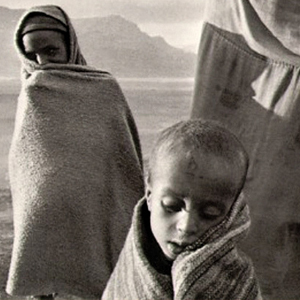 At the time some criticized Salgado’s images for their unsettling beauty. But perhaps because of this unique quality, they caught the public’s attention and were instrumental in bringing attention to this situation. 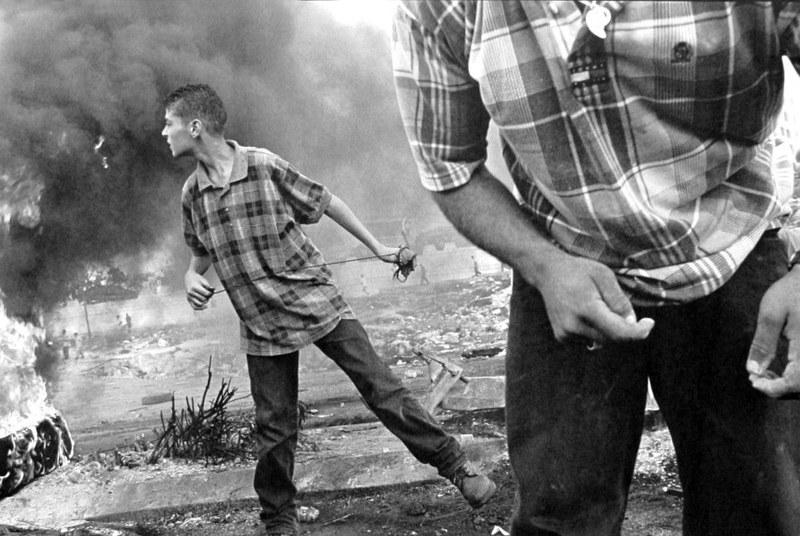 This image, taken by photographer Larry Towell in 2000, shows Palestinian boys throwing stones at Israeli soldiers. 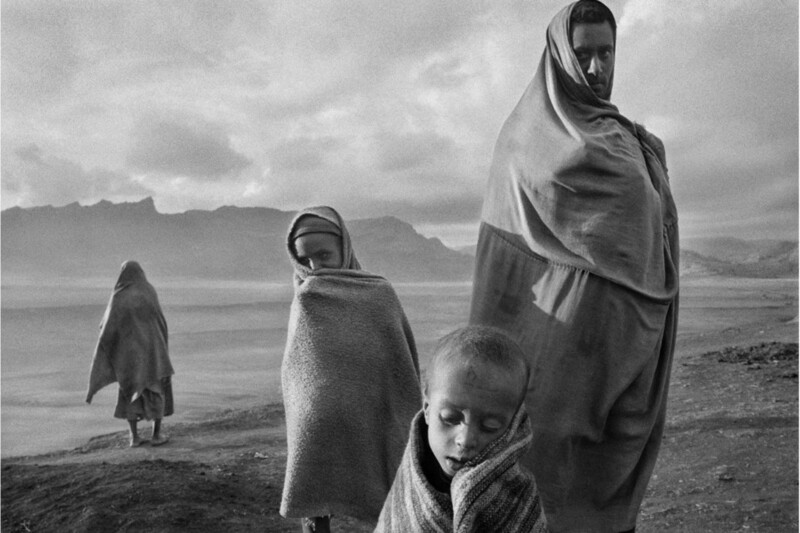 Towell is a well respected photographer who is known for its work to document struggles for basic rights in worlds filled with terror and repression. His images are regularly included in publications and education campaigns to show human interactions in complicated civil wars. The Israeli–Palestinian conflict, which began in the mid 1900s, has been called the world’s “most intractable conflict”. Despite numerous interventions from international actors, the issues continue to be hotly contested on both sides with no reconciliation in sight. Key issues are: mutual recognition, borders, security, water rights, control of Jerusalem, Israeli settlements, Palestinian freedom of movement and Palestinian right of return. The unemployment rate is extremely high, particularly for Palestinian youth. According to the June 2015 report by the International Labour Organization (ILO) the unemployment rate increased by 25% from 2014 to 2015. The average rate is 25% throughout the occupied Arab territories. Youth unemployment rate stood at almost 40%. This is a main contributor to youth unrest and anger as they feel that they have no prospects or future. Many have turned to violence to vent their frustration with this situation. This image of 5 year old Samar shows her screaming and splattered in blood after American soldiers opened fire on her family’s car in the northern town of Tal Afar in January 2005. 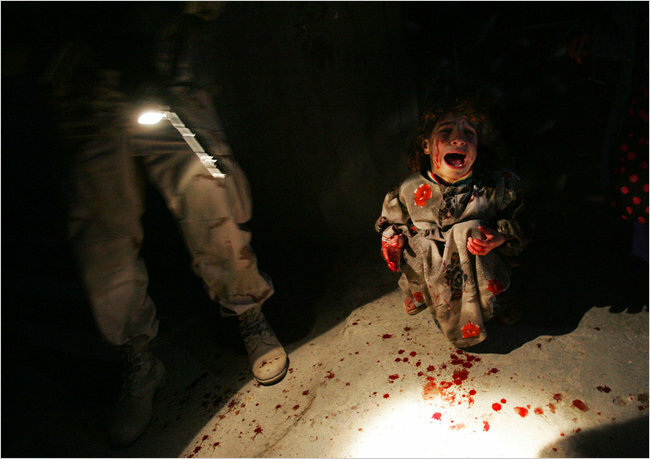 The picture has gained considerable attention as part of the body of work by Chris Hondros, the Getty Images photographer recently killed on the front lines in Misurata, Libya. The photo of Samar had far-reaching impact, for it was seen as a visual testimony to a terrible part of the war: the shooting of civilians. Civilians were seen as a threat and could be shot as they approached American checkpoints or foot patrols. These killings were made possible by liberal rules of engagement in order to protect soldiers from suicide car bombers. The image was a point of discussion at the highest reaches of the Pentagon as it considered ways to reduce civilian casualties. 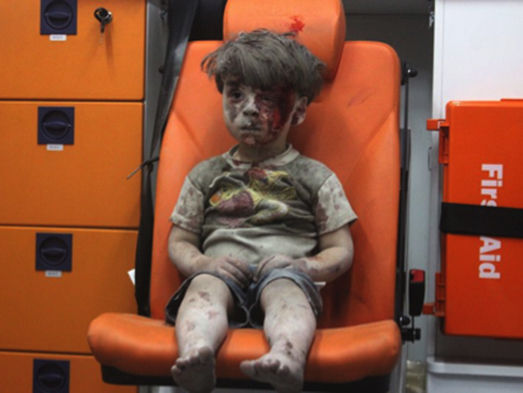 This photo of 5 year old Omran Daqueesh, was taken by photojournalist Mahmoud Raslan in August 2016. 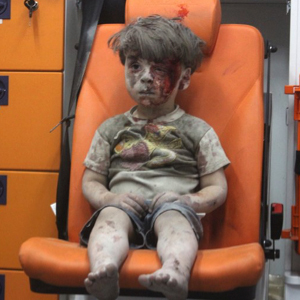 Omran is sitting in an ambulance after being pulled out of a building hit by an airstrike in Allepo, Syria. According to Raslan he had passed three lifeless bodies before seeing Omran. The civil war in Syria, which began in 2011, has caused hundreds of thousands of people to flee their homes. The photo of Omran appeared in newspapers around the world, praised for its powerful depiction of the reality of this war in children’s lives. 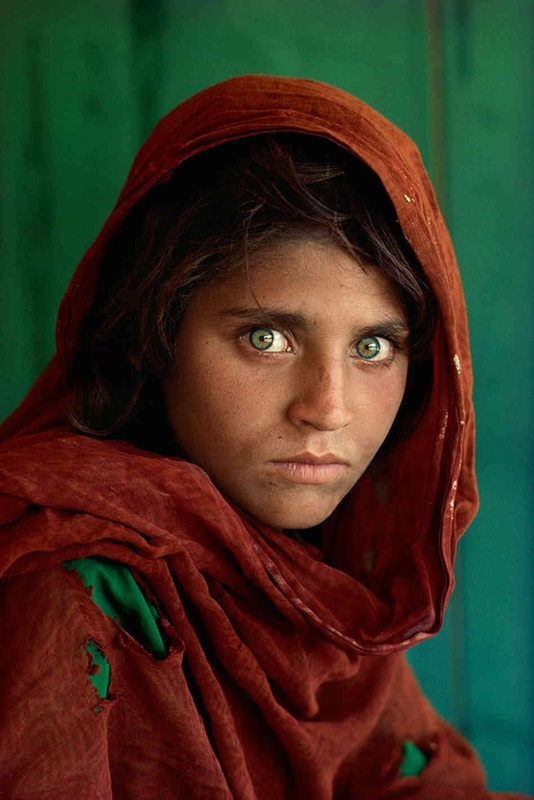 This portrait is of 12-year-old Sharbat Gula, a Pashtun orphan who was living in the Nasir Bagh refugee camp on the Afghan-Pakistan border when Steven McCurry, the photographer, took this image in 1985. The picture was featured on the cover of National Geographic. 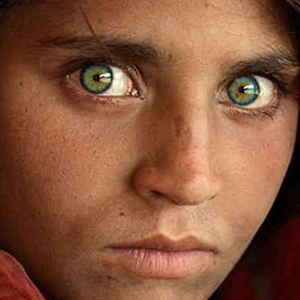 It received a huge amount of attention with Sharbat being called “the Afghan Mona Lisa” for her mysterious beauty and extraordinary green eyes. W. Eugene Smith was recognized as one of the greatest war correspondents of the last century. As the photographer for Life magazine, he followed the WW II American offensive against Japan. During one of the battles he was hit by mortar fire in his back. His war wounds cost him two years of hospitalization and plastic surgery. During this time he took no photos and it seemed likely that he would be unable to return to photography. This photograph went on to become very famous and appreciated by hundreds of thousands for its commitment to the beauty of life. 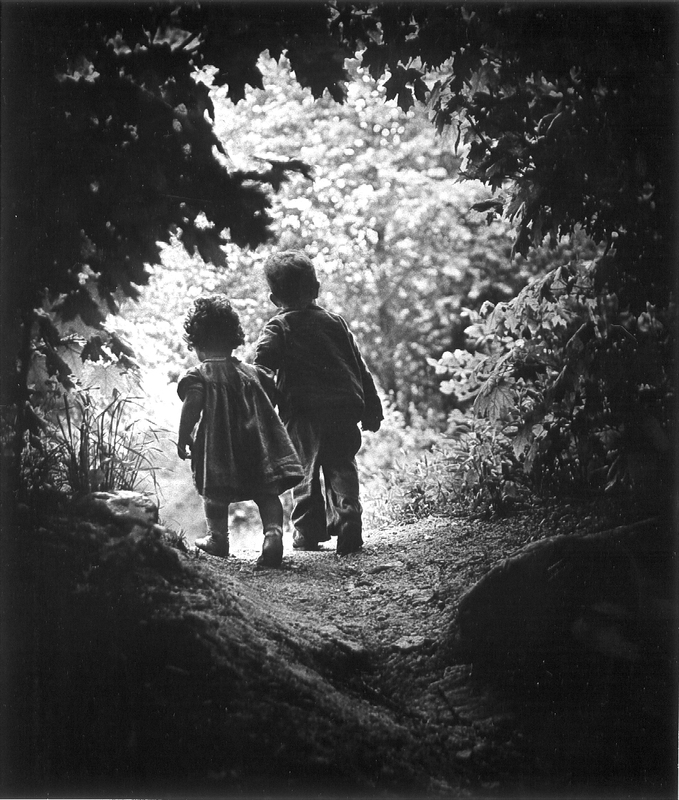 In 1955, Smith submitted the photo to Edward Steichen’s Family of Man exhibit. There it became a finalist and was placed as the final image in the exhibit. It continues to be recognized for its celebration of life.